Panchamrut and the name to my knowledge until now was only the one which was prepared and offered as neveidya during the puja time. It is a sweet mix/nectar prepared by mixing five ingredients and I just love it. To know what it is and how it is prepared you can read here. 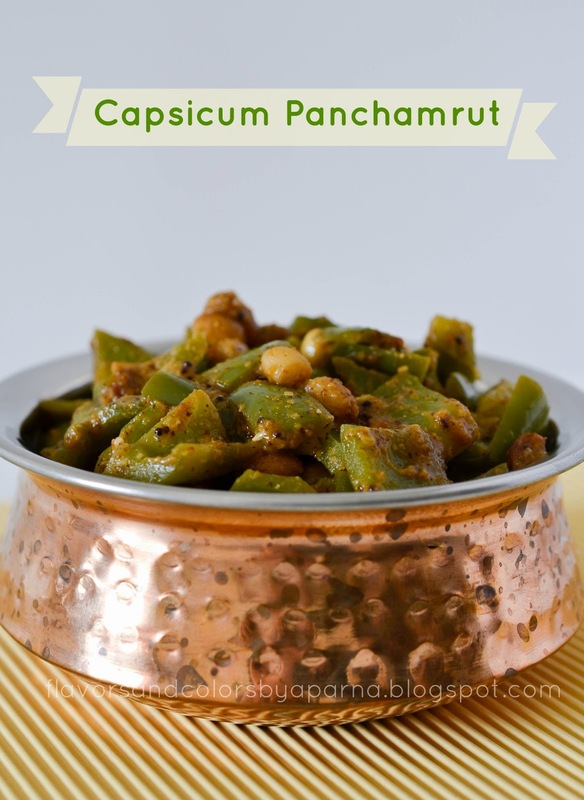 Now when my sis, Suppiakka uttered about "Capsicum Panchamrut" I found the name very catchy, an unique dish there and got more curious to know what exactly the recipe was. Immediately I insisted her to share the dish recipe. Upon asking how did it taste, she said this is spicy, sweet and tangy dish that tastes awesome even without the use of onions and garlic. So friends below is my sis recipe. 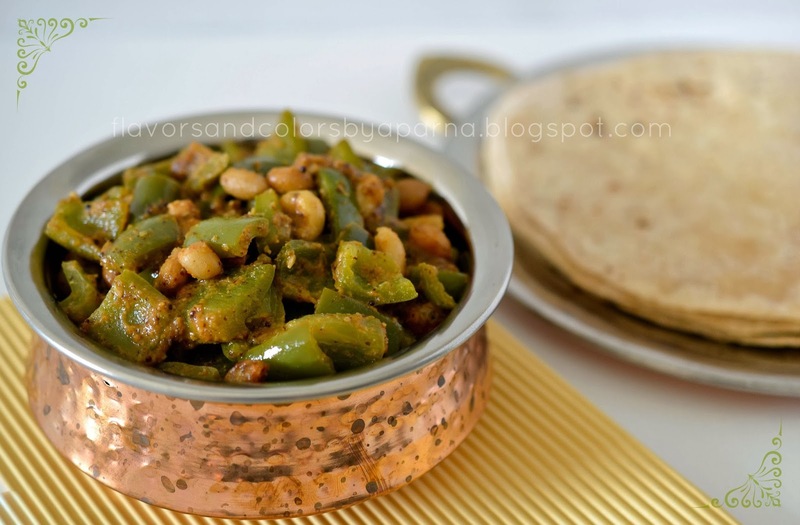 Believe me it tasted delicious and we relished it as side dish with chappatis. 1/2 kg [500 gms] capsicum, deseeded and chopped into small squares. Heat 1 tsp of ghee in a pan and roast 1 tsp of mustard seeds, methi seeds, hing till a nice aroma wafts through. Keep them aside and next roast broken pieces of red chillies [ byadgi variety]. Allow the ingredients to cool down and then grind it with grated coconut, tamarind and little water to a smooth paste. In final round of grinding add the toasted sesame seeds and give it a turn [ take care to keep the sesame seeds coarse]. Splutter remaining 1 tsp of mustard seeds in hot ghee in a pan. Add fistful of broken cashew pieces, raisins and boiled groundnuts. Stir it for 30 secs and then add chopped capsicum. Mix it well, cover the pan and allow it to cook on low flame. Once the veggie becomes tender add the ground paste, jaggery and salt. Cook till everything blends well and the gravy thickens. Switch off the heat and serve it with chappatis or rice. 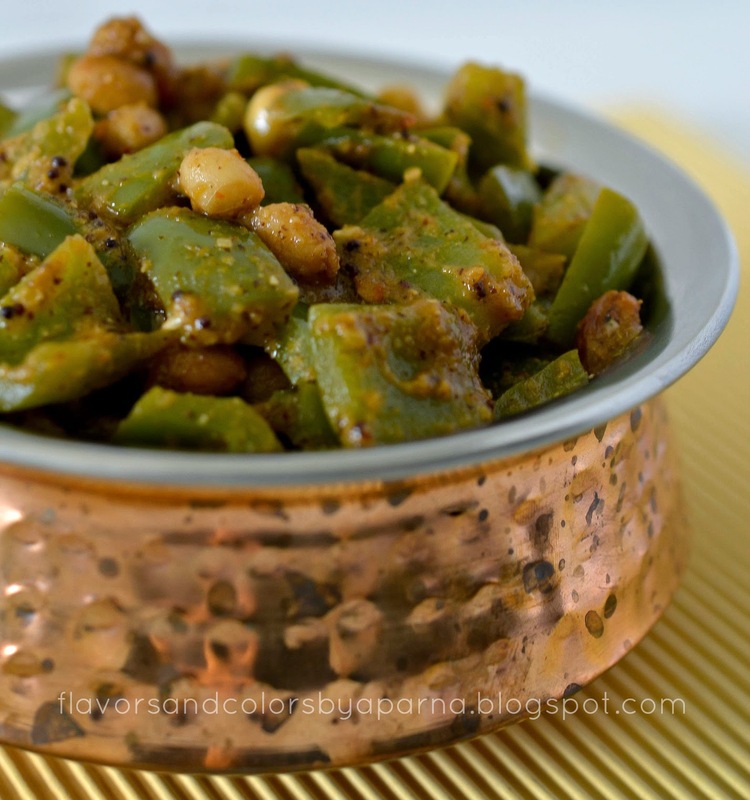 Note: You can adjust the quantity of red chillies, jaggery and tamarind to suit your preferences. looking yumm and nice clicks.